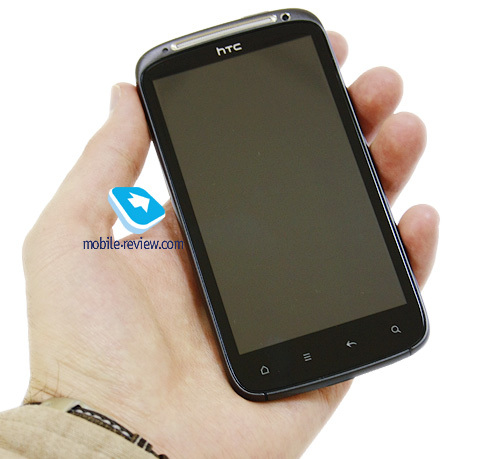 The release of HTC Sensation is an important event in Android world. Not because the Taiwanese company showed its flagship after the Korean competitors from Samsung and LG, but because at the moment of its release Sensation is the most technologically advanced Android smartphone. At least if we are going to look at such specs as the processor speed, RMA, screen resolution, etc. The announcement in spring can be explained differently. Some say that HTC shows the phone now to separate this important event from the competitor's news from MWC 2011, for others this time can look sensible from a standpoint of splitting the announcements of the Incredible S and the Sensation. The former had to be on the minds and lips of the public a bit before the latter one made an appearance. Or was HTC just finishing up the Sense 3.0? It's all irrelevant because Sensation takes us a year back, when HTC was a pioneer of Android-smartphone market and was releasing absolute flagships. Here we have an absolute flagship among the "Robots" for the next few months if not a half a year. The design is questionable to my taste. 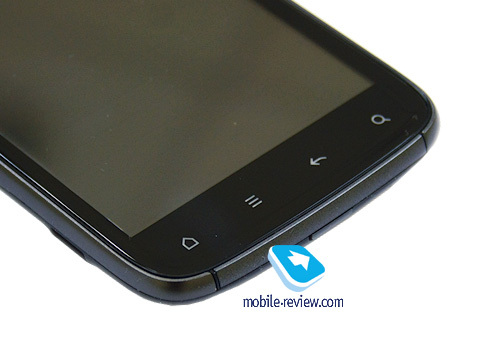 The "torn" battery cover is one example; I don't like it since it first was implemented on inexpensive WP7-smartphone HTC Mozart. This is however my subjective impression, you may have a different one. What you can't deny in the Sensation's design is the conventionality. The phone looks simple and unpretentious despite the mix of metal and plastic on the battery cover. The design in universal – "grey" enough, futuristic enough, there is nothing to talk about besides that battery cover. You may like the smartphone looks or have no emotions about it as it was in my case. There probably won't be many people who will dislike it. The only thing I do want to complain about is the color scheme used. I'm not a fan of three colors used; I hope there will be other versions with a single shade darker battery cover or a lighter one, just not the semi-grey it is now. Almost whole body is made from metal with exception of two plastic inserts on the battery cover and the Gorilla Glass covering the LCD. BTW, the screen is unusual – it is concaved a little. Don't know if I was able to illustrate this with the pictures. Thanks to this the screen will not scratch should you decide to place the phone on a desk glass down and start moving it back and forth. The smartphone is relatively thin, although it can't be compared with Sony Ericsson Arc, and it's heavier than Samsung Galaxy 2. The DIMS are 126.1 x 65.4 x 11.3 mm. In my opinion, significant weight for the flagship is only a plus, you feel in the hands a real thing and not a plastic rattle. You can compare the size of HTC Sensation with LG Optimus 2X or Samsung Galaxy S 2, with the same Sony Ericsson Arc, except for the thickness of the body they are similar. The phone feels comfortable in the hand. Build quality is good, and not only because of an exact fitting of the body parts to each other, but because of the design. The face, i.e. the plane of the screen and all the "insides" are inserted into a "box", made up from the battery cover. As a result, the whole design looks really solid. 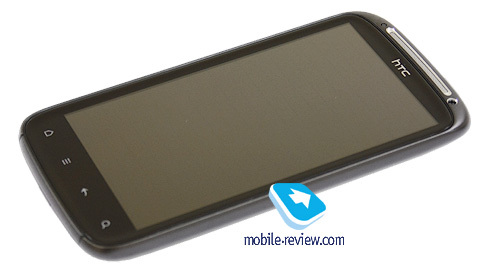 HTC Sensation uses the same sensor keys below the screen as most other new smartphones. The buttons are spaced well to each other, lit, comfortable to press. Power button is located on the top, here is also the 3.5 mm headphone jack. Volume control button is on the left edge. There is no dedicated camera shutter button, the camera needs to be activated from the menu. MicroUSB socket is on the left edge of the device. Outputs for HDMI are missing, so the potential users who want to use HTC Sensation to display images on a plasma or a LCD TV screen will need to buy an original adapter. The device uses 4.3" capacitive touch screen. Screen is S-LCD, as in the other new HTC models. Sensation is the first Android-phone with a screen resolution of qHD, 960x540 pixels, that is with a 16:9 aspect ratio. Here we can recall two other devices with high-resolution displays - Apple iPhone 4 and Meizu M9 – both have screen resolution of 960x640 pixels. Picture quality wise the display in HTC Sensation is good. To me, a big fan of the classical TFT and similar displays, the screen in Sensation seems the best on the market. However, we must understand that for brightness and color it's just normal, there is no riot of colors and fusion of brightness as on the flagships from Samsung or LG. The display has excellent viewing angles, a good range of brightness. Sensation uses an 8 megapixel camera module and dual LED flash. Relying on the increased power of the device in comparison with previous models, the company added support for video recording in FullHD (1080p, 1920x1080 pixels), as well as simple photo and video editors. It's too soon to jump to conclusions about the camera, lets wait for the production samples. 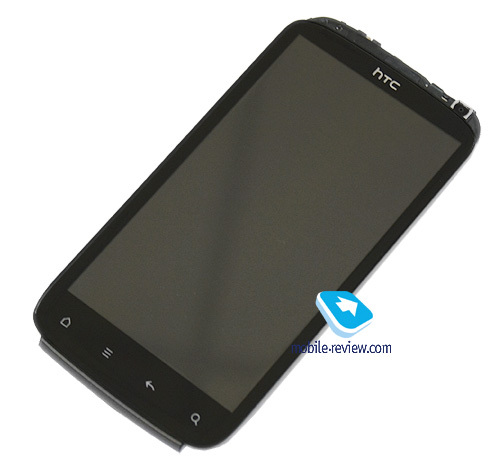 The smartphone runs Android 2.3 with the latest version of the HTC corporate interface Sense. And the latest today is the freshly presented HTC Sense 3.0. Let's briefly go over some of the most notable features of the new Sense. A new screen lock. Now, instead of a curved line a ring is used to unlock the screen, you need to pull the ring from the bottom to the center. Above the ring there are four customizable icons (you can choose any) i.e. address book, call log, email and messages. If you pull the icon inside the ring it will unlock right into the inside of this application. Changed are the effects of going through the virtual screens, it is now a three-dimensional carousel - looks impressive, but there is no practical benefit or harm. There is now an OEM app manager. There is Wi-Fi print feature. The keyboard now has the option of writing without lifting a finger of as in Swype, here it is called HTC Trace. The weather widget changed, it is taken from HTC Hub for Windows Phone 7. Also, now when you click on the weather, a window will open with full weather animations - users and Apple iPhone iPad know what it is via Weather HD app, the HTC Sensation is now using almost the same program (set of effects). There is no longer a limit to the number of windows opened at the same time in the browser, particularly good news for me. 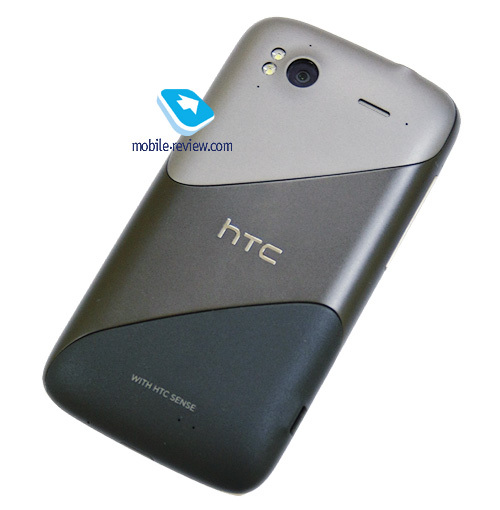 Some of these changes are found in the Sense on HTC Desire S, but some have come out in a Sense 3.0, probably thanks to the total number of diferences the version number of the interface from HTC has changed. I'll try to give you the details about changes and updates in Sense 3.0 in a separate article. The device is built on Qualcomm MSM 8260, this new platform from Qualcomm with dual-core 1.2 GHz processor. Will the HTC Sensation perform better in synthetic benchmark tests faster, slower or at the same level as devices based on the nVidia Tegra 2 is too early to predict, we must wait for the final samples and a stable firmware. During a brief acquaintance I had nothing to complain about, but I've done nothing special with it. The smartphone has 768 MB RAM and 1 GB of data storage. In addition, the Sensation has a slot for microSD. The set of wireless interfaces is standard for a modern Android smartphone - Wi-Fi, Bluetooth and GPS. 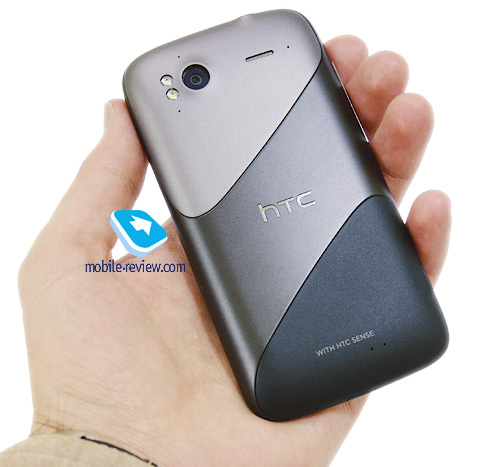 HTC Sensation will go on sale in Russia tentatively in June. At the same time, the company promises to announce a price for the device, though it is already possible to make some assumptions about the price tag. Probably, the starting price will be no less than RR28 000-30 000($1,000 - $1,100) yet we have here a new flagship of the company, which stands a step above the existing HTC Desire HD. The new smartphone is made on the principle of "faster, higher, stronger" – HTC practiced such an approach for many years and only in 2010 the accents were shifted towards services and the expansion of the range. However, with Sensation the old priorities returned and personally I'm glad. The new platform with a dual-core processor, the new high-resolution screen, a new version of HTC Sense, support of high definition video recording – with the HTC Sensation the company does not toy with one feature or another, but simply raises the overall bar for Android smartphones. Of course, we all realize that today the time of champions passes quickly, a couple of months - this is the period of stay on the top. 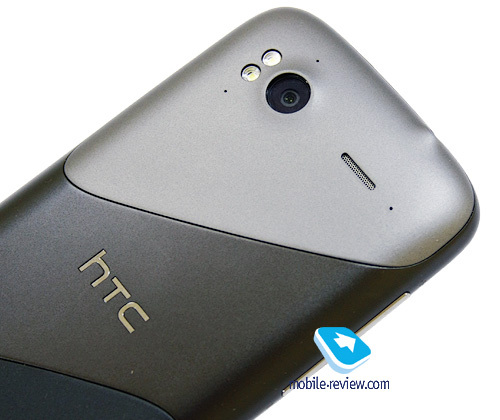 Because of this, HTC Sensation does not become less attractive and interesting. If you are wondering which Android smartphone will be one of the most technologically advanced this summer - one of the answers is in front of you.